The regular season enters the home stretch and after a 5-1 outing the season tally is 54-15 as California and the Ducks hit their bye week. A heavy-weight showdown in Palo Alto gets this week’s slate started but not before a review of last week’s results. The Jekyl & Hyde Utes put the pieces together with 21 third quarter points to pull away from the Bruins who were without the services of starting quarterback Josh Rosen. Utah’s Tyler Hundley threw four touchdown passes against a defense that held the Ducks to 74 yards in the air. At several points in the early going the Trojans looked to be on the verge of sending the Wildcats down for the count. Despite trailing 28-6 at one point and on their way to coughing up 311 yards rushing and 331 yards in the air, with 8:23 left in the game Arizona had pulled even at 35. USC turned two fourth quarter Khalil Tate interceptions into a pair of touchdowns to put a strangle hold on the southern division race. A defensive stalemate looked to turn Stanford’s way when Bobby Okereke stepped in front of a Luke Falk pass for a pick six and a 21-17 Cardinal lead late in the third quarter. With the loser out of the northern division race, Falk and the Cougars kept their hopes alive with an 11-play, 95-yard scoring drive. Trailing 27-17 entering the fourth quarter the Sun Devils scored 24 points in less than 10 minutes to send the Buff’s to the bottom of the southern division standings. ASU’s DeMario Richard scorched Colorado for 189 yards and a score on 25 carries and teammate Manny Wilkins completed 18 of 34 passes for two touchdowns and ran for 95 yards and a score. Ross Browers threw for a pair of touchdowns and running back Patrick Laird set a pair of career bests with 214 yards and 33 carries to lead Cal to the win in Berkeley. Another shoulda, coulda, woulda for the Beavs who struggled getting a running game untracked. The Bears held Ryan Nall to 37 yards on 12 touches. Ex-Duck Thomas Tyner added 41 yards and a score. A 21-point third quarter barrage put an exclamation point on a game that was already decided at the half with Washington leading 17-3. Despite 247 yards rushing against the best defense in the conference, Oregon’s inability to throw the football – Braxton Burmeister completed 7 of 13 pass attempts for 31 yards – allowed the Huskies the upper hand from the start. 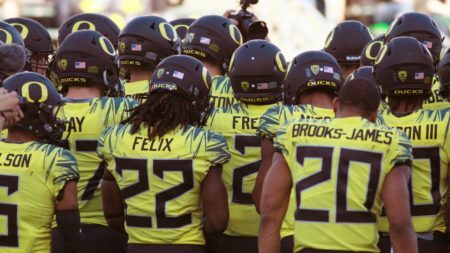 A fumble and an interception didn’t help the Oregon cause. The Cougs haven’t played particularly well on the road but if they hope to challenge Washington for the northern division championship come Apple Cup, they need a win in Salt Lake. With that in mind, whatever momentum the Utes found in thrashing UCLA won’t prevent a 38-25 WSU win. Bruin quarterback Josh Rosen is expected to return to the line-up and that certainly gives a boost to UCLA’s chances. Unfortunately the Bruin’s porous defense – after giving up 48 points to Utah – is likely to give up at least that many to the Sun Devils. ASU 55-38.